An excerpt from Wendy Moore’s The Knife Man: The Extraordinary Life and Times of John Hunter, Father of Modern Surgery. In the world of Georgian England, where physicians didn’t deign to touch patients and left surgery to the professionally inferior surgeons—or barbers—a Scot named John Hunter fed his insatiable appetite for anatomical information by carving up thousands of corpses (and so, incidentally, helped to spur a thriving body-snatching business). 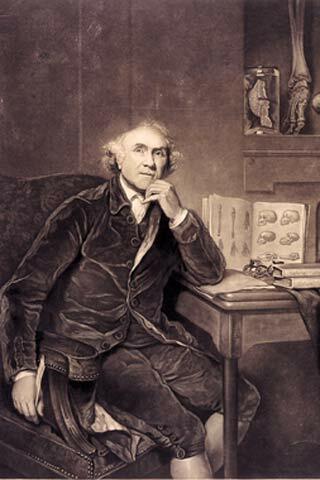 In The Knife Man: The Extraordinary Life and Times of John Hunter, Father of Modern Surgery, Wendy Moore escorts readers inside Hunter’s classroom in his brother’s Covent Garden anatomy school, where students were encouraged to rally all their senses for observation. It was a far cry from today’s medical schools, which are starting to bring part of their anatomy lessons into the untainted virtual world. Since the guts were the first parts to putrefy, the students would begin by slitting open the abdomen, folding back the flaps of skin and fat, and examining the organs of digestion: the stomach, the more than 30 feet of intestines and the smaller organs, such as the spleen, gallbladder and pancreas, packed tightly into the abdominal cavity. Next, they would open the chest, sawing apart the rib cage to expose and remove the lungs, the lobes of which were blackened by London’s ubiquitous winter smogs; mastery of dissection demanded not only intricate skills with a knife but brute strength with a hacksaw. The lungs discarded, the pupils could examine the heart, which even the most novice anatomist now knew, having studied Harvey, to be the center of the human physiological system. Hunter would then help the pupils with the tricky task of inspecting the other main organs—the liver, bladder, kidneys, reproductive organs and brain—encouraging them to probe the cavities with their fingers, follow the vesses with their knives and weigh the organs in the palms of their hands. Finally, they could work on the muscles, which decayed slowest, and the bones, which Hunter showed them how to wire together to create their own articulated skeletons. More than 2,000 objects remarkably unfit for consumption lodged in throats, lungs and stomachs. One physician retrieved them all. A cadaver, an anatomist and a press of onlookers in a sixteenth-century engraving inspire a twenty-first century verse. Eighty years ago, a perceived telepathic experience led Hans Berger to create the electroencephalogram.